How to Compare Two PowerPoint 2013 Presentations? This article will explain in easy steps on how to compare two Microsoft PowerPoint 2013 presentations quickly. The Microsoft PowerPoint 2013 offers one of the easiest way to compare the PowerPoint presentations. Follow the below steps to find out how to do it. 1. Launch Microsoft PowerPoint 2013 and open the original PowerPoint presentation. 2. Click the Review tab and the hit the Compare button. 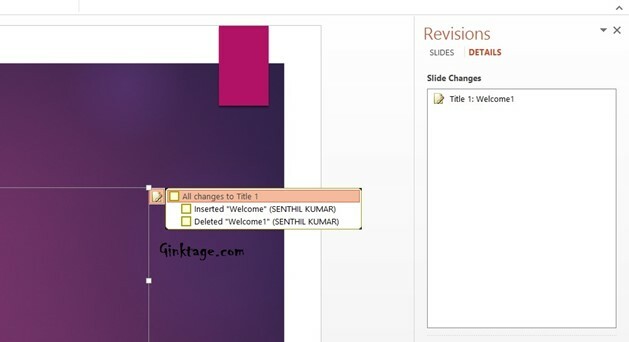 This will open up a dialog that lets you to select another PowerPoint presentation which needs to be compared to. 4. Once done with the comparison and changes, you should accept or reject the changes to the presentation file. To do it, click “Accept” or “Reject” button. When the Accept button is clicked, the selected changes are incorporated to the presentation. If the Reject button is clicked, the original version of the changes is restored. 5. 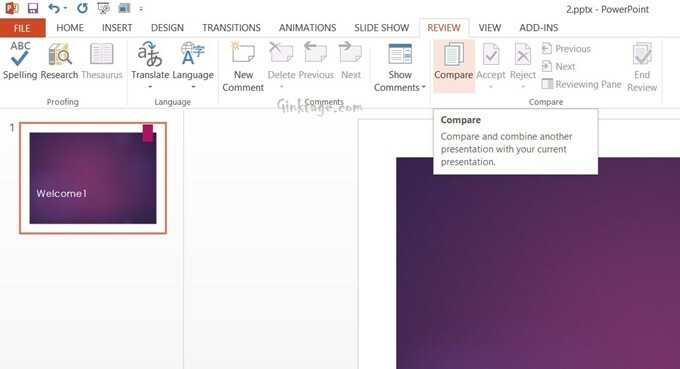 You can hit the “Next” button in the Compare group section to move to the next changes in the PowerPoint presentation and follow the same steps as above.